Note: This product has a $15.00 surcharge for oversized carton. 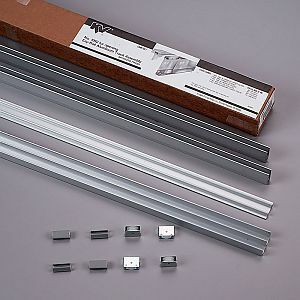 Knape and Vogt Roll-Ezy Aluminum Track Set. 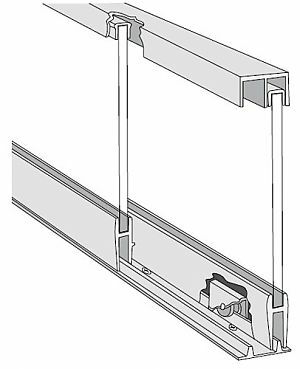 Provides smooth track system for lightweight, sliding glass doors to move back and forth with ease. Ideal for small to medium glass door installations, such as reception windows and small retail display cases. Set Includes: (1ea) 1093 double channel upper track; (4ea) 1097 nylon roller press; (4ea) vinyl guide; (2ea) 1095 door shoe; (1ea) 1099 double lower track. For installation of 2 by-passing 1/4in. thick, small to medium sliding glass doors. Load rating: 20lbs. per door. Recessed or surface mounted; installs easily with with nails or glue. A wide divider on upper channel maintains door position. Components can be easily cut for custom opening sizes. Corrosion free, anodized aluminum finish. Installation Notes & Recommendations: KV recommends that the height to width ratio for glass doors should not exceed 2:1. Cut glass 1-3/16" shorter than overall height.